When I was in Mumbai, Café Mondegar was one of my favorite restaurants. I never forget to visit this place whenever I visit Mumbai. Recently I visited Café Mondegar few months back. Nothing was changed. It was as cheerful as energetic as it was before. Café Mondegar is best café if you wish to have a glass of beer but don’t like going to a bar. Café Mondegar serves good quality beer and delicious food. There is no place in Mumbai which can beat its painting, it ambience, its food, and its Juke Box. It is one of the oldest café in Mumbai. It is started by Irani family. Café Mondegar is also known as Mondys. It stands at the lip of Colaba Causeway located in Mumbai. Many people this place where you get only beer… no no that’s not true it’s more all day café than a bar. Mondys does not serve beer which contains too much alcohol. If you are going with your friends then you can order pitcher full of cold beer. Take one table and enjoy food and chilled beer. Hey girls if you don’t like beer then you can go for breezer as well. I ordered cranberry flavor. 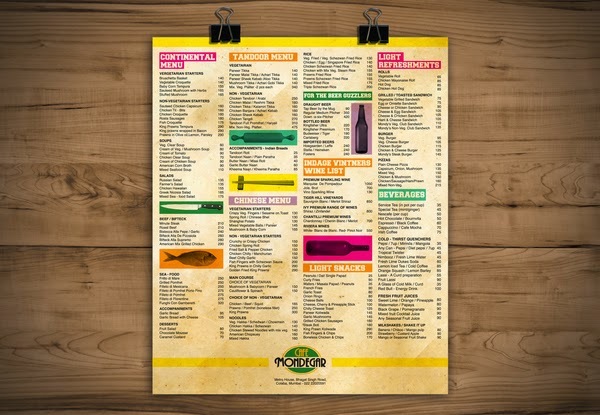 You can also go for other drinks from menu. You can have lemonade, frappe cold coffee etc. You can order lip licking foods. I ordered French fries and crisp and spicy veg cheese burger. Café Mondegar has truly unchanged and untouched interiors, specially the giant mural. Those amazing paintings are done by Legendary Indian Illustrator – Mario Miranda. When I saw his painting for the first time I went flat and clicked many photos. Simply loved the wall full of beautiful paintings. There I saw very old juke box in the corner, I asked cashier to get some change, so that can listen some classic English songs. Girls if you are planning to visit, Colaba Causeway for shopping in this hot climate then Café Mondegar is best place to beat your heat. 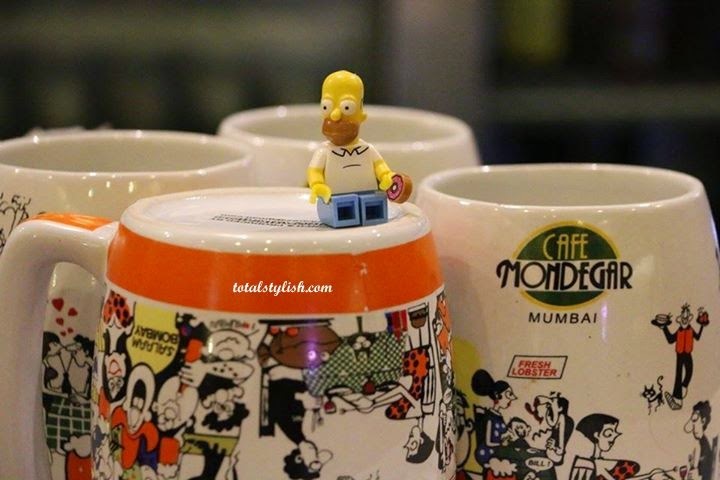 Have a look at some photos of Café Mondegar.